In all organisms, the nervous system receives information about the environment via specialized sensory organs. This information is then processed and integrated to produce relatively permanent changes in future behavior. These changes of future behavior that reflect past experience are the manifestation of memory. The molecular mechanisms that underlie these changes are poorly understood. 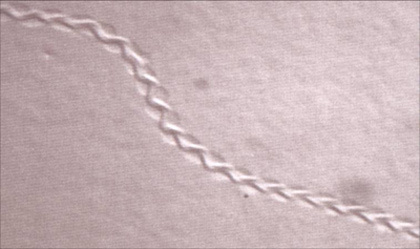 C. elegans with its fully charted simple nervous system of 302 neurons offers a unique platform in which to study these mechanisms. We aim to identify genes required for the sensory transduction and integration that forms the basis of learning and memory in the nematode. We and others have identified specific DEG/ENaC proteins that are hypothesized to normally function as the central mediators of touch transduction and proprioception (how the body maintains coordinated movement) in C. elegans. Members of the DEG/ENaCs superfamily of ion channels have been identified in nematodes, snails, flies and vertebrates including humans, where they serve diverse functions such as ion homeostasis and sensory transduction. See this review for a more extensive discussion and our lab entry at ionchannels.org. Mechanotransduction is the process by which mechanical energy is converted into cellular signals, and is essential for hearing, balance, touch, and for regulating muscle contraction and blood pressure. A long-standing problem in the mechanotransduction field has been that genes encoding mechanically-gated channels eluded cloning efforts, resulting in a large gap in our understanding of their function. These mechanically-gated channels are postulated to be tethered to both the extracellular matrix and to the cytoskeleton, linkages that serve to deliver gating tension to the channel. Proprioception in the nematode: wild-type animals inscribe a sinusoidal track as they move on an agar plate evenly covered with an E. coli bacterial lawn. The characteristic properties(amplitude and wavelength) of tracks inscribed by unc-8(lf) mutants are drastically reduced. See this paper for more information. We are combining genetic, molecular and biochemical approaches to determine and compare the composition/regulation of mechanosensitive channel complexes in nematodes. Members of the acid-sensing subgroup of DEG/ENaC ion channels (termed ASICs) have been implicated in synaptic plasticity, learning and memory in mammals. We find that ASIC-1, a novel DEG/ENaC protein and a close homologue of mammalian ASIC, is highly expressed in head sensory neurons and interneurons. ASIC-1 is required for conditioning to several chemical attractants, while it is dispensable for chemotaxis. Consistently, this gene is also required for associating the presence of food with the rearing temperature. Such observations indicate that DEG/ENaCs contribute to the capacity of the animal for associative learning. A working model for dopamine signaling modulation at dopaminergic neuron synapses. 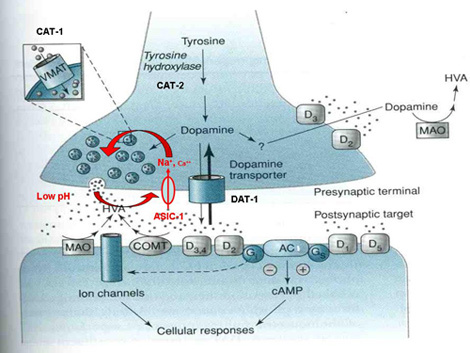 ASIC-1 provides positive feedback that reinforces dopamine release upon activation of dopaminergic neurons. We propose that evoked dopamine release, and the consequent local pH drop, activate ASIC-1, which promotes further dopamine release, resulting in sustained dopaminergic signaling. See this paper for more information. Therefore, ASIC roles in associative learning and memory might be conserved from nematodes to mammals, thus, making C. elegans an attractive model in which to dissect the relevant mechanisms. See this review for more information. See also this relevant Press Release and some Press coverage bits: To Vima, Ta Nea, Eleftherotypia, Kathimerini, Angelioforos, Patris, Tolmi/www.2810.gr, EKT.